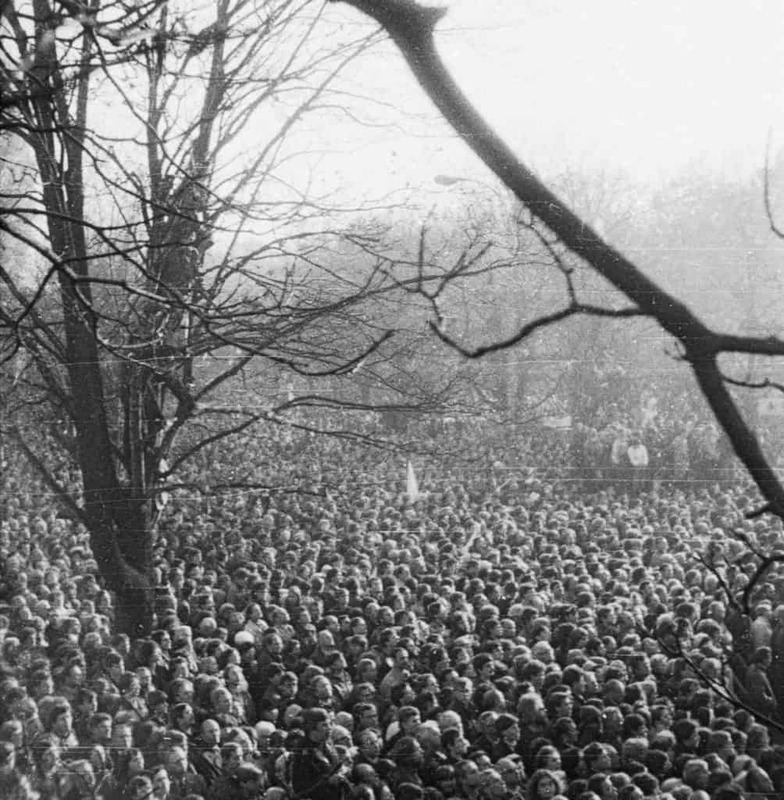 Polish opposition to Soviet-backed Communist rule gathered steam with the growing popularity of Solidarity. Founded in 1980 by future Polish President Lech Walesa, Solidarity was a movement and trade union that sought to effect social change and support workers’ rights in Poland. Owing to its growing influence and anti-Communist sentiment within Poland, the Polish government imposed martial law between December of 1981 and July of 1983, but eventually had to negotiate with the union. The Catholic Church, led by Pope John Paul II (a Polish national himself), was a major supporter of Solidarity and the movement came to be closely identified with the Church. 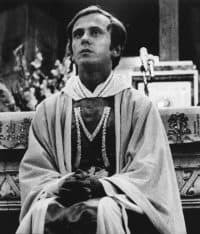 Jerzy Popiełuszko was a young, charismatic Polish priest who openly criticized Poland’s communist government. His sermons, which took a firm stance against communism and incited many to protest, were broadcast by Radio Free Europe and responsible for his mass popularity. Fr. Popiełuszko was murdered by three members of the Służba Bezpieczeństwa — the Polish Security Service — on October 19th, 1984, and his body dumped into the Vistula River. The murder caused widespread outrage across the country as his murderers were convicted and subsequently jailed. Popiełuszko’s gravesite became a site of pilgrimage for many, including such high-profile figures as Ted Kennedy and Lech Wałęsa. He was proclaimed a martyr by the Roman Catholic Church and beatified (the first step in the process to becoming a saint) in June 2010 by Pope Benedict XVI. These excerpts from ADST interviews explain what the sociopolitical climate was like in Poland at the time of Fr. Popiełuszko’s murder and highlight the role a religious organization can play in secular politics. John P. Harrod worked for the U.S. Information Agency (USIA) and was a Public Affairs officer at the embassy. Michael Metrinko was assigned to the U.S. Consulate in Krakow. Both were interviewed by Charles Stuart Kennedy beginning March 1999 and August 1999 respectively. Ambassador Darryl Johnson was interviewed by David Reuther beginning March 2006. Lane Kirkland was interviewed by James F. Shea and John R. Kienzle beginning November 1996. A 2013 documentary, Messenger of the Truth, narrated by Martin Sheen, was made on his life. Go here to read other Moments on Poland. One is this: The Poles were desperately attached to law and order. They had been smashed in World War II. They had lost whole cities, towns, villages. They had lost 20 per cent of their population. They did not want any more broken windows, any more shattered buildings, any more bombings, any arson or anything else. They wanted everything to be peaceful. This was all across the country. One reason being that if your window got broken, it was awfully hard to get glass to replace it, but still, nobody wanted disorder. At the same time, the Poles were incredibly nationalist and did not want any hint… or they were simply tired of having the relationship with the Soviet Union. It was a boot on Poland, and they knew it and they wanted out of it. It offended their sense of Polishness. Fine. Solidarity was appealing to Poles, but at the same time not appealing to the upper class of Poles – and yes, there was an upper class of Poles. Call them the Schlachta, if you will, the old sort of landed class. They had lost most of their land, but many of them still had their big houses and apartments. They still had their names, which were famous in Polish history. They still had their ties to being this or that — Daddy was a professor and mommy was this — and while on the one hand they supported Solidarity because it was a finger in the face of the Soviets, on the other hand, they considered the Solidarity people sort of “worker trash.” You had all that happening. Also, in the villages, they really did not care very much for Solidarity. The role of Solidarity never caught on. It was a worker thing from the big cities, but out in the villages and the farms, they didn’t care much about this at all. They just wanted to go to church on Sunday, get drunk on Saturday, and do the field work and get a job in the United States or Germany or Austria once in a while to get some hard cash — and nothing else, thank you. Now when I arrived there, all the Solidarity leaders were in prison. They were being allowed out of prison whenever they had an appointment at the American consulate or another Western consulate to process their asylum cases, so we had a list of people coming in every week, straight from prison for the day, to process requests for asylum in the United States. This was a Polish official way of dealing with Solidarity. I might add that no one, as far as I know, died in prison. The Poles who were in Solidarity and were taken to prison came out looking fat. They did not come out looking beaten, emaciated, or anything else. They came out looking pudgy and soft and fat, and most of them — not the top top leaders, not Lech Walesa and a couple of the others, but many of the sort of mid-level ones — simply went off to the United States or to other Western countries with asylum status…. You know what’s strange about all this was the position of the Church itself. The Church had a stake in security and stability. The Church was very Polish, very Polish, very nationalist. It had a lot of Church property. It had lost a great deal, but it still had a great deal. It had worked out a sort of life with the government. It worked together. You could get things done. But the whole thing managed to work. 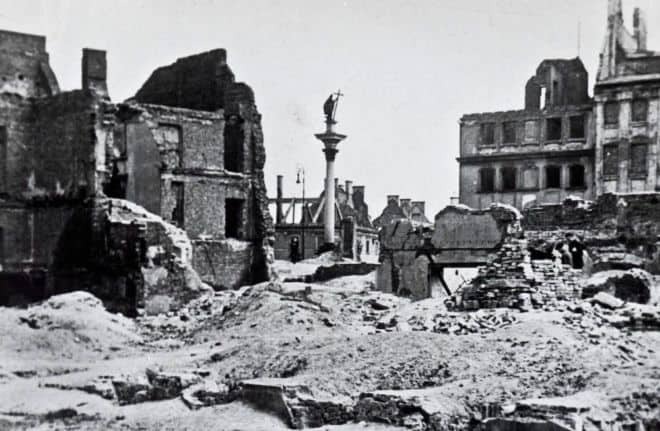 When you look at what happened in Poland during that period — say, 1980 to the breakup of the Soviet Union…which was not a short time — almost no one died. Very few people, for political reasons. There were never many real accusations of nasty crimes by the government. They would hose people down. If there was a strike or if there was a big demonstration, the police would come out with their hoses, and they would use colored water so that it would stain the clothes of the people who were taking part in the demonstration, so they couldn’t use those clothes again. But that was it. They’d pick people up and then release them that day, and yes, they were rather unpleasant around the consulate — they did quite a bit of harassment of consulate people, and they also harassed people coming and going. They would follow my car, for example, and stay a few inches away from the car the whole way — literally, almost touching the car — things like that. But they didn’t kill, they didn’t hit – not really — at least not that we knew of. [This]…wasn’t rightful rebellion. Poles aren’t rebels. It wasn’t going to happen there. There were too many strong forces that wanted things to go slowly. 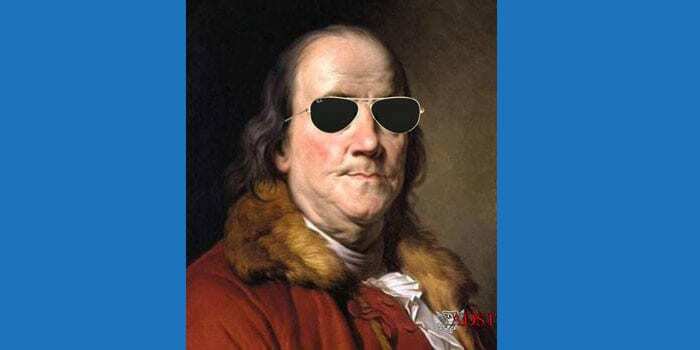 That included the education system; that included the Church, which was very strong; that included the business interests there; and that included the government. The whole way that Solidarity was treated by the government, I think, was indicative of this — that they weren’t smashed. They were broken up, but not smashed. And I think you could see the results when Solidarity took over –…the Communist Party one morning disappeared. Nothing really happened to the old high-ranking Communist officials. They all became part of the new government or simply took jobs in private industry. They didn’t go to prison. They were the places we’d loan our video equipment to, and they’d become kind of semi-legal rallying points for the opposition because the government really wasn’t interested in cracking down on the Church. That would have been a little too much. However, at least in my perspective — I’m not sure everybody would have agreed with me on this — one always had to keep in mind that the Church also had wings that represented the more — what’s a good word here? — nationalistic and obscurantist, perhaps, wing of the Solidarity movement, and so you had to be a little bit careful, at least I thought we had to. The Church was not a monolithic organization in Poland by any definition, but it was a very important part of society, and so we did work with it. When Tom Simons, who was Deputy Assistant Secretary, came out to Warsaw, I had a lunch for him, and one of the people there was a priest who was active in the sort of “cultural movement,” in opposition to the government. He was invited not because, essentially, he was a Catholic priest but because he was a member of that part of the opposition. But by definition the Church was important. When Father Popiełuszko was murdered, you know (“Who will rid me of this troublesome priest” I believe is the English example), the fact that he was a confessor to many of the Solidarity opposition people and active in the opposition was important, but the fact that a priest was murdered was just as important, and his grave became something of a shrine. 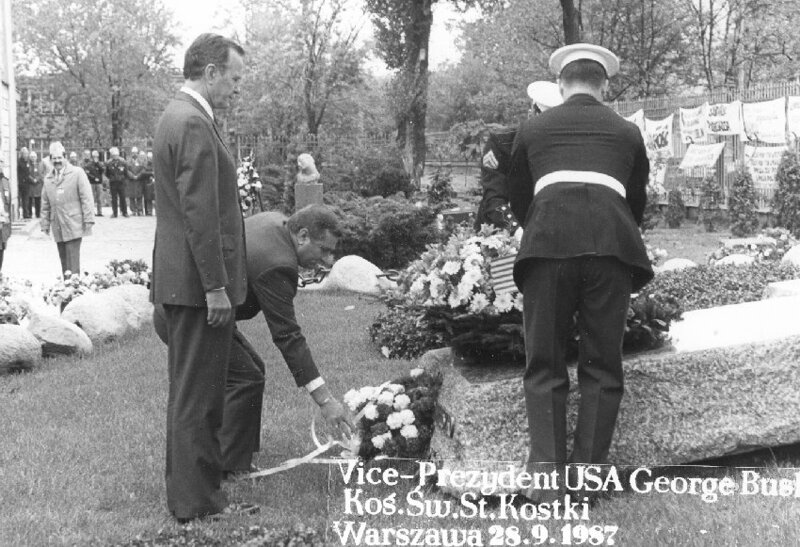 When Ted Kennedy came in ’87, he made the pilgrimage to Father Popiełuszko’s grave…. I sort of cavalierly used that “Will no one rid me of this troublesome Priest?” [King Henry II’s remark about Thomas a Becket, Archbishop of Canterbury] line, but I think there was something to that. I think some fairly mid-level to junior people in the security service thought they had the green light. Their superiors probably never really imagined that somebody would do away with this priest, but they did. You know, this is not some Third World country where priests are murdered, because the analogy, back in the mid-80s, there were priests being murdered in Central America, and the Poles didn’t particularly like that comparison. So I think it was probably some folks who exceeded their authority and went too far, but Popiełuszko then became the martyr and the rallying point for the opposition. And I said, his grave was a shrine and probably still is. JOHNSON: One of the things that [Vice President George H.W.] Bush did was to go to this church and to lay flowers on the tomb of Father Popiełuszko [three years after his death, in 1987]. There were thousands of people. The Poles were out there in incredible numbers. The security services couldn’t prevent them from coming to the church. 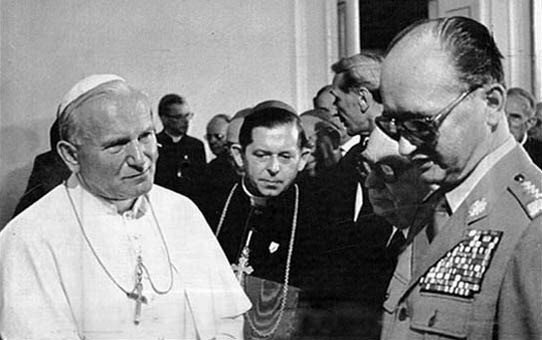 In fact, the regime had an odd kind of relationship with the Polish Catholic Church at that time. If something was taking place on church grounds, the authorities wouldn’t intervene. As long as it was a Church-sponsored event, even if it was George Bush, not a Catholic visitor, they nonetheless tolerated it, this kind of outpouring. The result was that we wanted to follow up and see what the opportunities were for gradual political opening. We were about a year early at that point but, of course, the wheels were beginning to turn. [Opening up] means a lot of things. It means opening up in terms of freedom of discussion, in academic circles or the press or unblocking the Voice of America or Radio Free Europe, things of that kind. Basically, it means more political tolerance. At that time they weren’t ready for it, but within a year they were, and that lead to one of the great revolutionary changes of our time. Two points here: the highlight of my tenure as DCM in Warsaw was the State Visit by President George H. W. Bush in the summer of 1989. This visit followed the first free elections in Eastern Europe on June 4 — the same day as the Tiananmen massacre in Beijing and the death of Ayatollah Khomeini in Iran. The Davises [Ambassador John and his wife] hosted an elegant lunch for the President and his entourage, and comparable guests on the Polish side. KIRKLAND: They had a big celebration in Gdansk [in 1990, on the tenth anniversary of Solidarity’s founding] around that memorial in the shipyards, and they had invited us to place a plaque on the wall in the shipyard right adjoining that memorial. So we dedicated that plaque at that ceremony. I laid a wreath at that monument and then unveiled the plaque. It was quite an affair. But immediately before going to Gdansk, I stopped in Warsaw before going to Gdansk, and I visited and placed some flowers on the tomb of Father [Jerzy] Popiełuszko at his church in Warsaw. He was the priest who was murdered by the Secret Police.